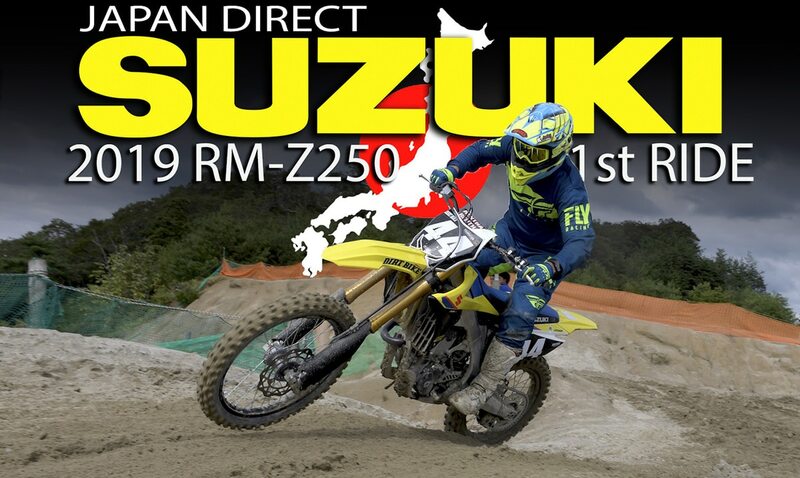 The good news is that the long-awaited 2019 Suzuki RM-Z250 has been revealed. Suzuki pulled the sheets off of it earlier this week. The bad news is that it’s still a long way away from arriving here in the U.S. Right now, it looks like the bike will show up around the first of the year. We couldn’t wait, so we went directly to the source. We sent Managing Editor Mark Tilley to one of Suzuki’s test tracks in Japan to be one of the first non-Suzuki riders to swing a leg over the bike. 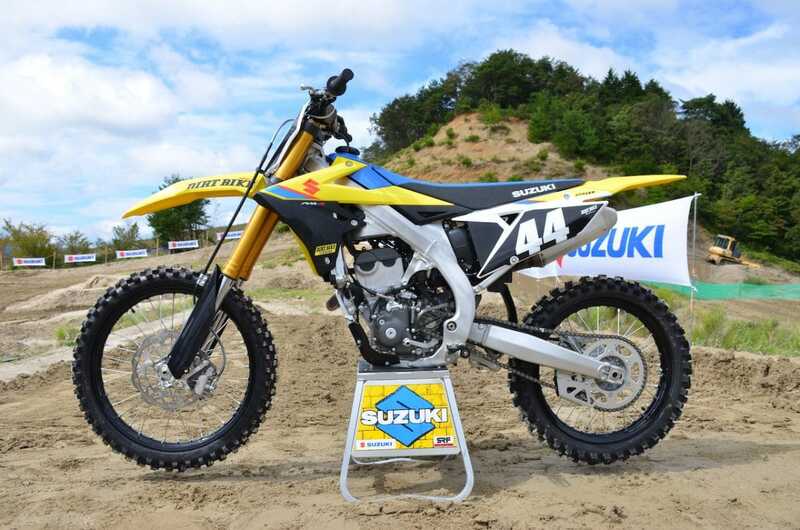 Suzuki treated the bike to many of the same designs and updates that the RM-Z450 got for 2018, but with key differences. The most interesting of these is the move to dual injectors, similar to the system used for the Kawasaki KX250. A secondary injector is placed between the air filter and the throttle body, and it kicks in at high rpm. There is also a 30% larger air filter intake aperture, a straighter outlet to the throttle body, a redesigned exhaust port and increased fuel pressure. The whole exhaust system has been redesigned with a longer, tapered mid-pipe, too. It still uses Suzuki’s multi-level holeshot assistance system (called S-HAC) and color-coded couplers to adjust the power delivery. Sorry to say it didn’t not get electric start. In the chassis department, the frame is new but very similar to that of the new 450. Compared to the older 250 frame, it’s narrower, lighter and more rigid. It also repositions the motor with more of a forward rotation. 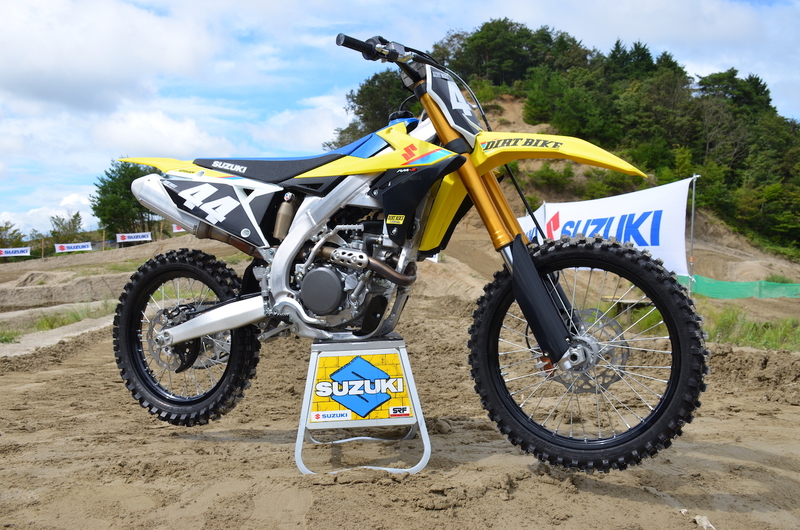 Unlike the 450, the RM-Z250 uses KYB suspension. The fork has dual-coil springs and the rear shock has four different ways of adjusting the damping, plus new linkage. The front brake rotor is larger, the rims are now DID Dirt Stars and the tires are Dunlop MX33s. Our riding session was limited to four hours between rain storms, but it was enough to get the feel of the new bike. 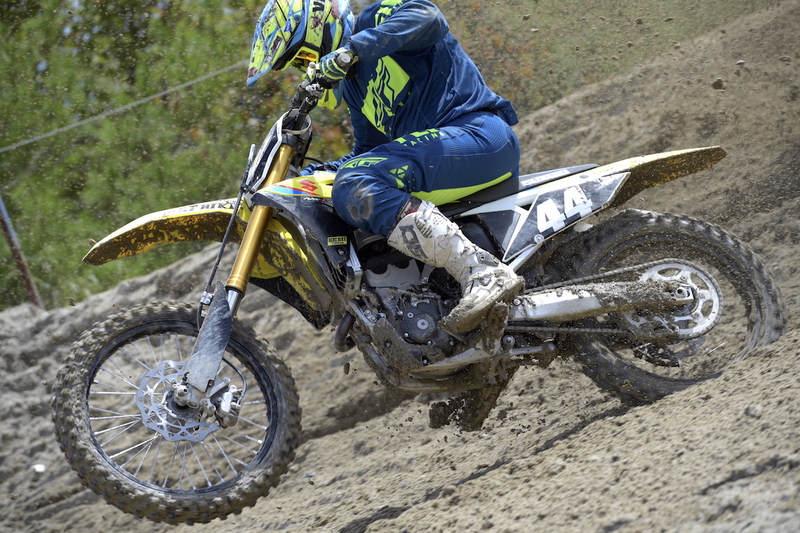 Frankly, we were a little apprehensive when we learned that the bike shared so much with the current RM-Z450. That bike has a strong fan base, but it still took a beating in our 2019 450 MX shootout. 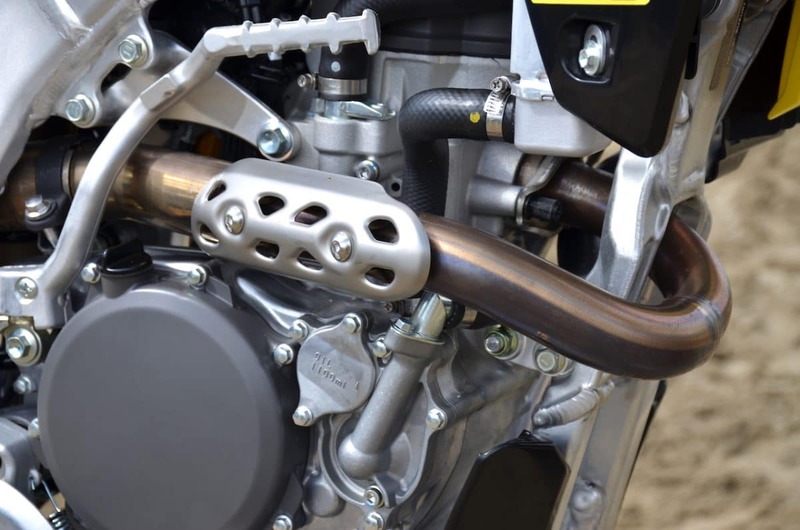 Most riders feel it’s unbalanced with a distinctly rear-high riding attitude, and any attempts to deal with that result in a compromise of the bike’s traditionally strong cornering ability. We were pleased to learn that the new chassis is actually much better suited to the 250. In fact, most of the 450’s weaknesses were either lessened or non-existent on the 250. It still corners exceptionally well, and the KYB suspension components provide an excellent ride. We added a few clicks of rebound damping and the bike seemed surprisingly well suited to Mark. That might be a cause for concern for the typical 250 rider, who is around 20 pounds lighter than Mark, but all we can report is what we experienced, and that’s outstanding suspension action. Its cornering ability is every bit as strong as it has been for years. In the motor department, we feel confident that the RM-Z is stronger than the 2018 model. That bike, however, was significantly down on peak power compared to the rest of the class. The new RM-Z250 has decent low end but still falls off on top where most of the current 250s have improved dramatically in recent times. It was also oddly hard to start. With the white coupler in place, the bike gains noticeable power–much more than we have experienced with the system in the past. 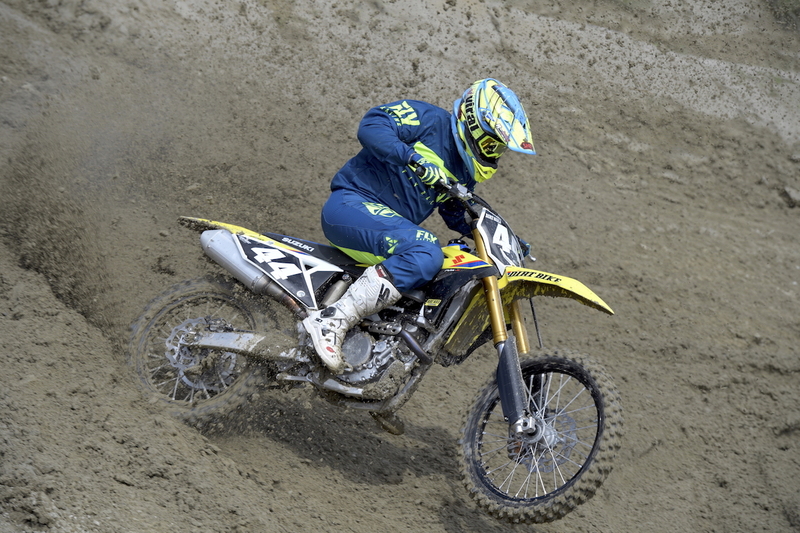 Of all the bikes in the current 250F class, the Suzuki is most similar to the 2019 Kawasaki KX250. 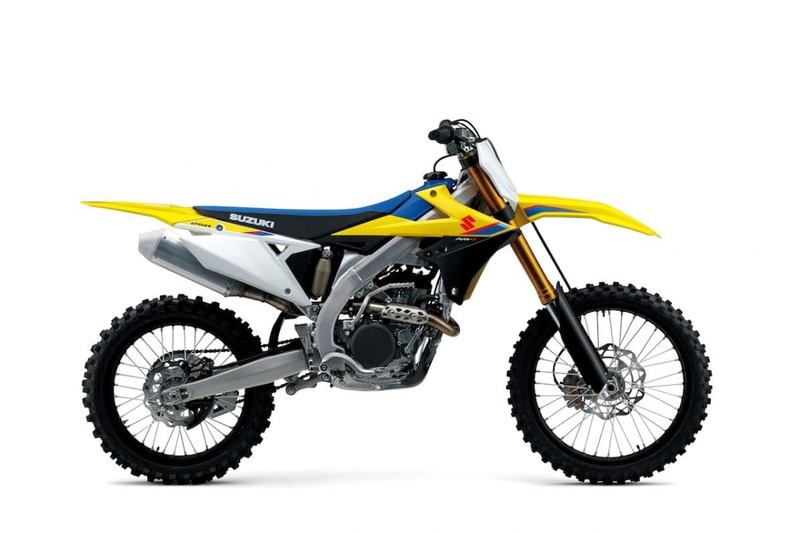 Our impression of the new Suzuki RM-Z250 is by no means complete. For one thing, the bike we rode was a pilot production model and might not be representative of the final production units that will appear in dealers. For another, our riding time was limited on an unfamiliar track. Our next experience with the 2019 Suzuki RM-Z250 will take place sometime in November, when a few production models will be flown to the U.S. for magazine testing. Check back then to see a more complete review.